Calicut University honours Mohanlal with D.Litt. 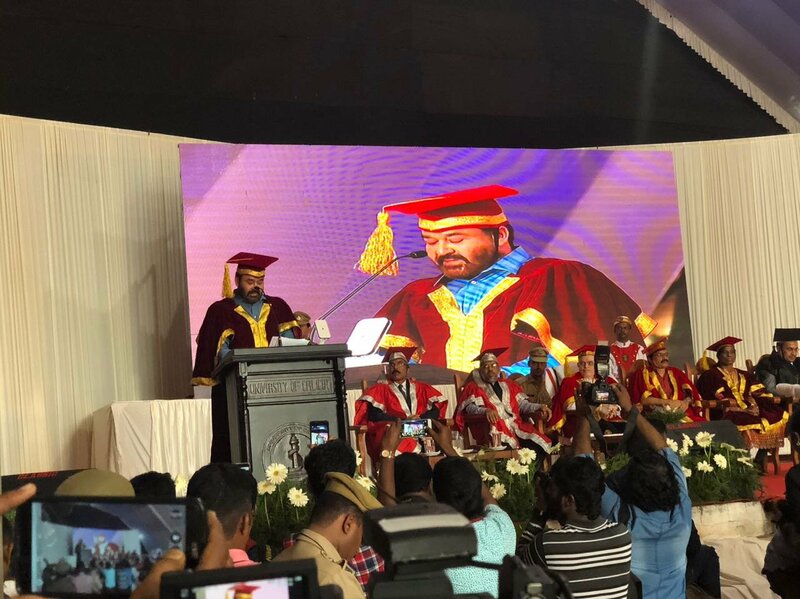 The Calicut University has conferred its highest degree on Actor Mohanlal for his contribution and excellence in the field of acting. Kerala Governor and Calicut University Chancellor P Sathasivam awarded the actor with the honorary degree at a function held in Kozhikode today. Along with Mohanlal the legendary sports athlete P.T Usha was also conferred with the highest degree for her contribution in the field of sports. The University had announced its decision of honouring Mohanlal, P.T Usha and the Sharjah ruler Sheikh Sultan Bin Muhammed Al Qasimi four years ago and they were all supposed to be honoured in September 2017 when Sheikh Qasimi visited the country. But due to some reason, the function was shifted from Kozhikode to Thiruvananthapuram at the last minute. The University decided to honour the superstar and P.T Usha in Kozhikode at a separate function. The actor had earlier received the honours from the Kalady Sree Shankaracharya University of Sanskrit in the year 2010. Superstar Mohanlal was always outstanding with his performance during his career spanning close to four decades and still continues his glorious run at the top.